There are many considerations when first establishing a small business and we are frequently asked to assist companies with their logo design, whether for a new company or as part of a rebranding. Why is your logo so important? A well-designed logo is the equivalent of a signature tune for a popular television programme. It is instantly recognisable and, as part of a creative marketing campaign, will be associated with the image of both your company and its activities that you want to project. In short, it symbolises your corporate identity and you want your clients to remember it. Your logo design therefore needs to be capable of being equally effective in different sizes and on different coloured backgrounds. Other factors are considered below. For a small business, we advise that your logo should reflect what your company does, whether your company manufactures a product or provides a service. It is best that you envisage your logo lasting for at least ten years, with a minimum amount of amendment, so we work closely with our clients to define their business ethos, ensuring that this is reflected in the logo design. Of course, the ideal is that we create a timeless logo that can be used without modification for many years to come. Simple is always best. A very complex logo might be trendy at the time of design, but it could quickly become out-dated. Clean lines are the most effective when the logo is to be used in many different sizes as part of your creative marketing campaign. It’s important that you have your logo in vector format which allows it to be shrunk to fit on a business card or expanded to fill a giant bill board without distorting. The colours of your logo design are also very important and our article on choosing colours for your web design has some interesting and useful background to choosing colours, both for your logo and your overall web design. Colours are also significant when you are aiming at a multilingual market for your products or services. Different colours can have a different meaning for different cultures, as discussed in the article mentioned above, so it is important that you are aware of any nuances suggested in the use of particular colours. Your choice of colours may have to work against a variety of backgrounds, including white – the most common colour for stationery. The more colours you use, the more expensive subsequent printing costs will be, which can be an important factor for a small business – or indeed for large, multi-national companies too. The colours you choose should be appropriate to the type of business you run. Bright colours may be suitable for children’s clothes or toys, but perhaps less so for other types of business, such as management consultancy or accountancy. There will probably be very little text in your logo – perhaps just a couple of words, but those words require careful selection. This is particularly true if you are targeting a multi-lingual market, as the same word can have a completely different meaning in French, for instance, than in English. Just one example is the word “pain”, which means “bread” in French, so it would be reasonable to include it in the logo for a specialist baker in France. Using the same logo, with the word “pain” in English would have very different and undesirable connotations. As many of our clients have multilingual markets, we are aware of these kinds of pitfalls and ensure that they are avoided in our web and logo design work. We are delighted to advise on creative marketing for new businesses who are considering targeting markets in French, German and Spanish speaking countries, as well as English markets. Choose a designer who has some experience with a type of business similar to your own. Have a look at designs they have produced for other clients and don’t be afraid of asking questions about how they will work with you and what happens if the design needs slight modification in the future. (We recommend, once your logo has been established, that any changes are very slight, so that customers remain loyal to the familiar brand). Ensure that your logo will be provided in a range of formats and includes a vector version, as mentioned above. Having invested times and money in creating a logo which works well for you and your business, you will need to protect it from being copied by registering your design as a trademark. More information can be found at this UK Government website: https://www.gov.uk/topic/intellectual-property/trade-marks . This article has, hopefully, given you some food for thought when it comes to logo design. If you feel we can help further with logo design, website design or internet marketing, please do not hesitate to contact us. With Love, a new cafe and restaurant in London, NW6, came to us with a beautiful draft design of their logo, incorporating a subtle heart shape. We created their logo as a vector graphic, so that they could use it at a large scale on the outside of their restaurant, as well as on napkins, menus, etc. The name of the restaurant embodies the care and attention with which they prepare and serve food and drinks. Example of a logo we created as a vector graphic for Daily English, who organise English language immersion courses for French students in France. We were requested to convey in the logo that it's a French student staying with an English family in France, hence our choice of using the British and French flags as part of the design. The project for Daily English also included creating the website, business cards, posters, a certificate of attendance and a brochure, all of which feature the logo as a graphic prominently within them. While this logo is more complex than many that we create it's received a very good response from Daily English's customers and has been widely appreciated. As it's for a service, rather than a product, there wasn't a concern about making it simple enough to print on labels, for example. 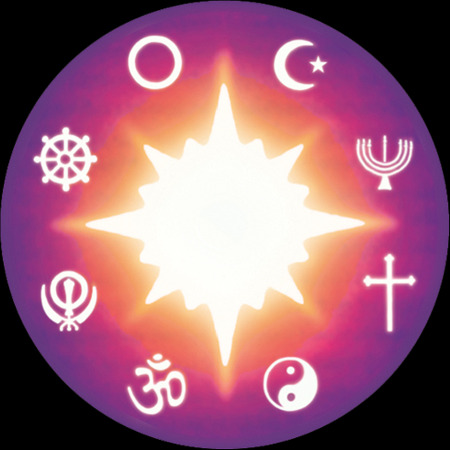 While completing the web redesign for the One Spirit Interfaith Foundation we created this logo to symbolise their services "to serve people of all faiths and none in our diverse communities". View more examples of our logo designs.